Get the most out of every adventure. 2019 Toyota RAV4 Hybrid Coming Sometime in March 2019. Whether you’re around town or out of town, the 2018 Toyota RAV4 Hybrid gives you the opportunity to take your journeys even further. The new SE Hybrid adds another level of efficiency to the lineup, while the new Platinum grade enhances the premium look and feel. Its full-body color treatment gives it a sleeker look, while inside, ambient lighting and a heated steering wheel are there to cater to your needs. And since Toyota Safety Sense™ P (TSS-P) comes standard on every RAV4, you have everything you need — style, SUV capability, and safety — to venture out to more places. All new Toyota RAV4 Hybrid models include the features shown below. Additional equipment and option upgrades are available. 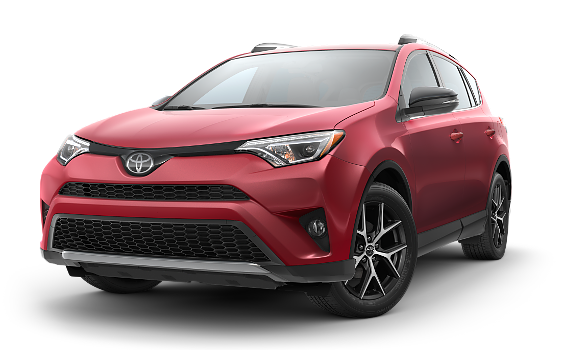 If you need specific answers about Toyota RAV4 Hybrid Trim Packages, Upgrade Options or Available Inventory, please Contact Us today. The 2018 RAV4 encourages you to venture out in style. Its bold front end creates a chiseled look, and side lower exterior panels add to its appeal. It’s a package that’s as athletic as it is refined, and it’s ready to take you on that next great journey. It’s the details that make all the difference. RAV4 SE is available with the S-Code paint treatment. 1 Silver-painted accents are added on the front and rear bumpers, side lower trim and fenders. Such perfectly placed touches help give RAV4 a refined style all its own. Enjoy every trip, from uphill to downtown, in RAV4’s roomy interior. The driver and front passenger enjoy available heated seats and dual zone automatic climate control. Another convenient piece of tech is the available Smart Key System.1 The available leather steering wheel has a luxurious feel, and Entune™ Premium Audio with Integrated Navigation2 and App Suite3 and a frameless HomeLink®-capable mirror4 further enhance the premium high-tech experience. Immerse yourself in the interior design and drive in complete comfort. RAV4 helps you customize your comfort. Available multi-stage heated SofTex™-trimmed front seats help tame those chilly nights. And finding the perfect driving position is never an issue, thanks to an available 8-way power-adjustable driver’s seat with memory function and power lumbar support. RAV4’s available Bird’s Eye View Camera 1 helps you see nearby objects and get into and out of the smallest spaces with ease. The system includes Perimeter Scan—an innovative feature that displays live, rotating 360-degree views of your surroundings when you’re parked. Back up with confidence. When you shift into Reverse, RAV4’s standard backup camera 2 displays a real-time view of what the camera sees behind you on the 6.1-in. touch-screen display on the dash. 2 The backup camera does not provide a comprehensive view of the rear area of the vehicle. You should also look around outside your vehicle and use your mirrors to confirm rearward clearance. Environmental conditions may limit effectiveness and view may become obscured. See Owner’s Manual for additional limitations and details. 5 SiriusXM audio services require a subscription sold separately, or as a package, by Sirius XM Radio Inc. If you decide to continue service after your trial, the subscription plan you choose will automatically renew thereafter and you will be charged according to your chosen payment method at then-current rates. Fees and taxes apply. To cancel you must call SiriusXM at 1-866-635-2349. See SiriusXM Customer Agreement for complete terms at www.siriusxm.com. All fees and programming subject to change. Not all vehicles or devices are capable of receiving all services offered by SiriusXM. Current information and features may not be available in all locations, or on all receivers. ®2018 Sirius XM Radio Inc. Sirius, XM, SiriusXM and all related marks and logos are trademarks of Sirius XM Radio Inc.
7Always drive safely, obey traffic laws and focus on the road while driving. Siri® is available on select iPhone®/iPad® models and requires Internet access. Siri® is not available in all languages or all areas and features vary by area. Some Siri® functionality and commands are not accessible in the vehicle. Data charges may apply. See apple.com and phone carrier for details. Siri® is a registered trademark of Apple Inc.
8Advanced voice recognition capabilities vary by head unit. 9iPod®, iPhone® and App Store are registered trademarks of Apple Inc. All rights reserved. By illuminating a warning signal on the correct outside mirror, the available Blind Spot Monitor (BSM)1 and Rear Cross-Traffic Alert (RCTA)2 help identify vehicles that you may not see when changing lanes or backing out of a parking space. We want to help you drive with more confidence. That’s why RAV4 comes with eight airbags,6 including our driver and front passenger Advanced Airbag System, driver and front passenger seat-mounted side airbags, front- and second-row Roll-sensing Side Curtain Airbags (RSCA), and a driver knee airbag and front passenger seat-cushion airbag. 3 Vehicle Stability Control is an electronic system designed to help the driver maintain vehicle control under adverse conditions. It is not a substitute for safe and attentive driving practices. Factors including speed, road conditions, weather and driver steering input can all affect whether VSC will be effective in preventing a loss of control. See Owner’s Manual for additional limitations and details. 4 Brake Assist is designed to help the driver take full advantage of the benefits of ABS. It is not a substitute for safe driving practices. Braking effectiveness also depends on proper vehicle maintenance, and tire and road conditions. See Owner’s Manual for additional limitations and details. 5 Smart Stop Technology® operates only in the event of certain contemporaneous brake and accelerator pedal applications. When engaged, the system will reduce power to help the brakes bring the vehicle to a stop. Factors including speed, road conditions and driver input can all impact stopping distance. Smart Stop Technology>® is not a substitute for safe and attentive driving and does not guarantee instant stopping. See Owner’s Manual for details. 6 All the airbag systems are Supplemental Restraint Systems. All airbags (if installed) are designed to inflate only under certain conditions and in certain types of severe collisions. To decrease the risk of injury from an inflating airbag, always wear seatbelts and sit upright in the middle of the seat as far back as possible. Do not put objects in front of an airbag or around the seatback. Do not use a rearward-facing child seat in any front passenger seat. See Owner’s Manual for further information/warnings. 7 Covers normal factory scheduled service for 2 years or 25K miles, whichever comes first. See Toyota dealer for details and exclusions. Valid only in the continental U.S. and Alaska. 8 Does not include parts and fluids, except emergency fuel delivery. Valid only in the continental U.S. and Alaska.